a wonderful public library, and the Chief Vann (Cherokee) cabin being restored. It sits right on the main street of town, a street (and a part of the Pinhoti Trail) that is part of the original route of the Trail of Tears national historic trail. And, of course Cave Spring has its Cave with a good sized stream of clear, cold water emerging from it. The cave itself was closed--only open to the public on weekends. Then it was back into the woods for a short two and a half miles--the last woods walking in Georgia. The trail passed 'Hematite Lake', named for the iron ore mined in the area. There was a lot of land ripped up--shallow quarries probably a century and a half old or more, with some of the tailings--low grade hematite, lying around. This land was purchased by an Alabama conservation initiative called 'Forever Wild'. The trail was for foot traffic only, and I love the open understory of the Alabama woods. It lets me see what's around me, and get views of the sky. Fire is the agent behind keeping these woods so open. And I ran into more Longleaf Pine growing in the most fire-prone areas. The area below Davis Mountain Shelter appears to be a restoration area, based on the fact that all the young trees are about the same age. This open area offered great views too. I passed three of them on this first leg, which ended at the 'High Point' trailhead, not to be confused with a trailhead parking area in Georgia with the same name. 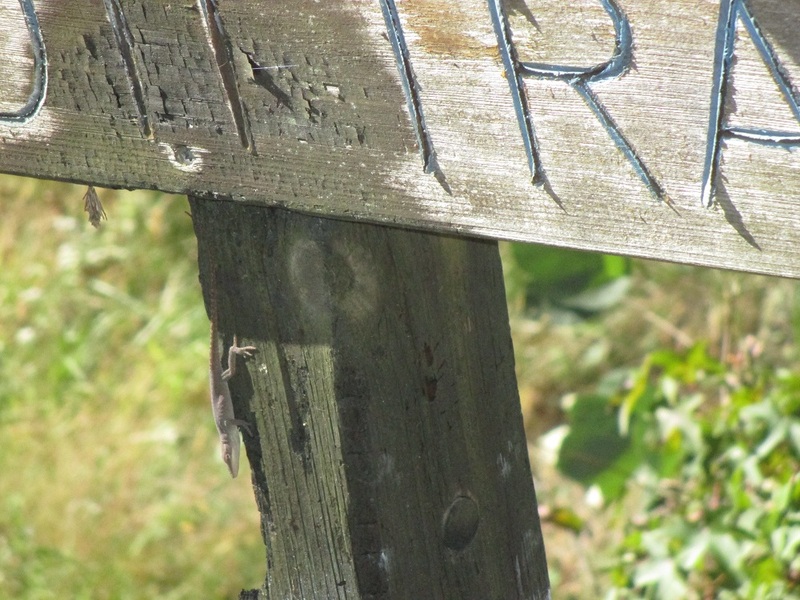 Lastly, not far from the trailhead, I passed this diminutive trail greeter. "Welcome to Alabama" he seemed to be saying. And as a foot traveler, I did indeed feel welcome here. The Pinhoti is a first class trail, and I recommend it to long distance hikers everywhere. Here's a map of the route traveled, with links to many more photos.